Banish patches of unwanted greenery and bring back the bladed beauty of your turf with these tips. Low-growing greenery that reproduces by means of spores, moss can be a lovely velvety addition to your landscape if grown intentionally—but few folks want clumps of it in the middle of the lawn. In fact, the appearance of moss may indicate that all is not well with your turf. 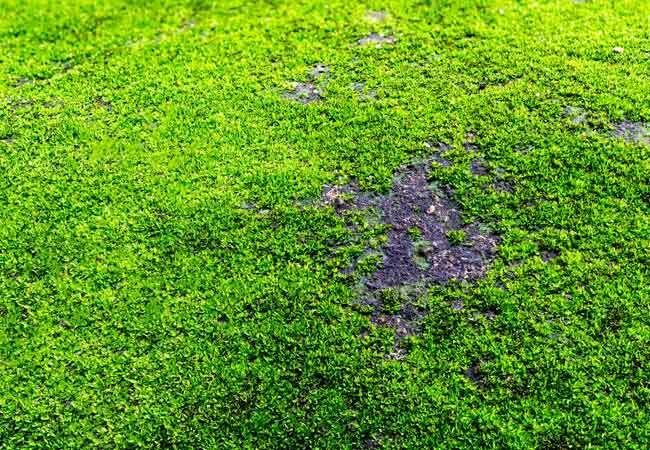 The damp conditions that favor moss growth are not conducive to a healthy lawn, and as grass suffers, moss will continue to flourish. Read on to learn how to get rid of moss in the lawn, as well as make simple changes sure to restore its natural beauty. Unlike most other plants, moss doesn’t have true roots—making it relatively easy to remove with vigorous raking or scraping. Rake by hand. 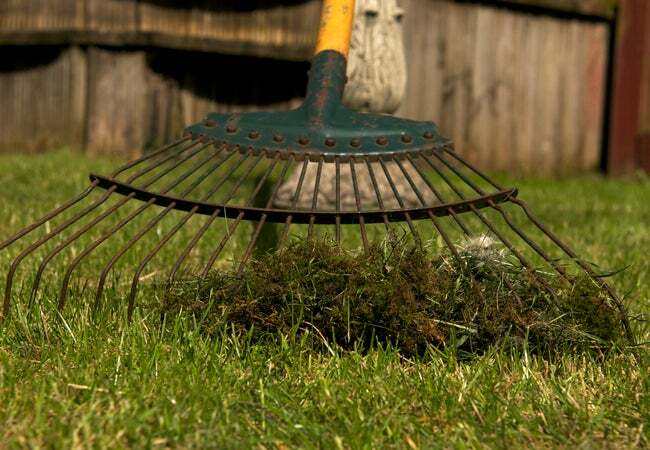 To get rid of a small patch of moss in the lawn, use a spring-tine lawn rake. The trick is to rake at the moss from different angles to loosen and lift it. Then, collect and toss the moss into your compost bin or trash. Use a mower dethatching blade. For a more extensive moss problem—or to simply make the task easier—remove it while dethatching your lawn. Use a dethatching blade (available at most garden centers or home improvement stores) on your push mower to pull up the thick layer of dead grass accumulated between the soil and the living lawn—and get rid of moss in the process. Dethatching makes it easier for water and nutrients to reach the roots of your lawn and, ideally, is best done in the spring or early summer. But if your primary goal is getting rid of moss in the lawn, you can dethatch at any time of year. Rent a power rake. These gas-powered machines, available for rent at home centers for about $75 per day, resemble lawn mowers. Instead of neatly clipping the tips of the grass, however, they aggressively remove thatch—along with moss—from the soil line. Power raking can be tough on your lawn, however, so it’s best to consider this option only if your lawn has an inch or more of thatch, along with heavy moss growth. Kill moss with an herbicide and it can easily be mowed or lifted out of your lawn. The two chemicals commonly used against moss have their downsides, however—and they’re strong stuff! Be sure to follow the manufacturer’s directions carefully, and keep children and pets out of the area while treating with either chemical. Glyphosate: The active ingredient in Roundup (which you can pick up from Amazon), glyphosate has only mixed results on moss. It will, however, kill any grass or other plants it comes in contact with, so only use this chemical on patches of moss growing on otherwise bare soil. Iron sulfate: More effective than glyphosate, iron sulfate (also called ferrous sulfate) kills moss in the lawn by drying it out. This chemical turns moss black, often within hours, and kills it entirely in just a day or two. Iron sulfate won’t hurt your grass—in fact, it’s a component of most lawn fertilizers—but it will create rust spots or stains on nearby concrete, brick, or stone. Be sure to wash away any stray herbicide right away with water and a scrub brush; stains that linger can be removed with a tri-sodium phosphate (TSP) and water solution. • Soggy soil: Moss thrives in damp conditions. So if your lawn is receiving too much water or it doesn’t drain well, moss—as well as patches of mildewed or dying grass—are bound to crop up. Cut back on watering to improve the situation. • Too much shade: Moss prefers shady spots of the lawn, such as underneath trees or where structures block the sun in the yard. Because most grass does best in full sun anyway, you may wish to devote shaded areas to such hardy shrubs, ground covers, or perennials as rhododendron, pachysandra, and ajuga. • Acidic or infertile soil: Check out your soil’s pH and nutrient levels with a soil test kit, easily found at a garden center or home improvement store. If your soil is acidic—which is hard on grass but great for moss—add lime to balance your lawn’s pH. If soil fertility is an issue—low levels of nitrogen, phosphorus, or potassium are often the cause—the soil test kit will guide you towards the best supplements or fertilizers to remedy the situation. • Compacted soil: Heavily compacted soil negatively impacts grass growth by preventing water and nutrients from reaching the roots, but it doesn’t bother moss one bit. Break up hard soil with a hand or power aerator annually, or as needed.